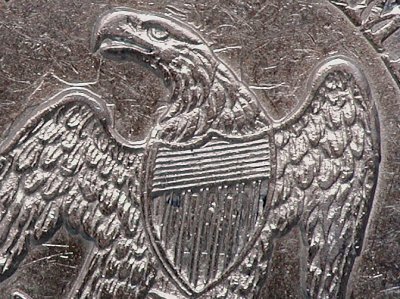 Personally, I tend to think of the 1857 with Flying Eagle Cent clash as a misunderstood variety. First, like any coin issue, not all examples are created equal. But, in addition to strike, technical grade, surfaces, luster and eye appeal, the strength of the clash also varies between examples. Apparently due to striking pressure, and/or die wear after the clash, even coins with similar strike characteristics and grade can have clash marks with notably different definition. Examples in lower grade (VF and below), with weak clash marks, or with too much embedded dirt and crust can be quite difficult to attribute. However, examples in high grade, with strong clash marks, or with clean surfaces are attributable with the naked eye if the collector knows what to look for and how to look for it. A coin in hand, rotated under an appropriate light source, will show distinctive clash marks above and below the eagle’s left wing and just to the right of the eagle’s neck. The key is the light source and rotating the coin under that light source in just the way it should be done to check for surface hairlines. Photography is another matter entirely. Attempting to capture the clash marks in a photograph or detect them in an EBay listing can be beyond challenging. The photograph for this column became such an exercise that it was necessary to enhance the clash marks with lines drawn in Photoshop (as seen below). That which can be seen so easily with binocular vision and movement under a light source can be maddeningly difficult to capture with a single, stationary lens and fixed light source. The most recent (and soon-to-be-published) quarter variety survey showed 15 examples in LSCC member’s hands; 7 in VF, 5 in XF and 3 in AU. 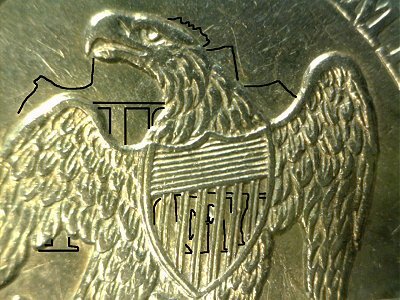 Both NGC and PCGS have one mint state example certified, with the finest known a PCGS MS64. The variety seems to be popular, rather expensive when attributed, and elusive with a rarity estimate of R5 (31 to 75 known) in all grades.